​Back in the days of CRT TV's the visible image was cropped, with some of what was called 'over scan' wrapped around the edges of the CRT picture tube. When computer monitors got cheaper, more people starting using them instead of their TV's. The side effect of this transition resulted in less of the over scan image being chopped off. And this trend continued with the advent of modern HDTV's, which now display every bit of possible video coming out of the A8. As a result, some games and applications that take advantage of this normally 'hidden' area of the screen to hide various graphics manipulations (akin to racing the beam), now have every bit of these artifacts revealed. So the main idea behind the GTIA V-Gate board is to hide these areas that were never meant to be seen, by 'blacking' them out. The GTIA V-Gate board is meant to piggyback the existing GTIA chip, thus providing a 'no solder' installation. However due to keyboard clearance issues in some systems, removal of the original GTIA socket may be necessary (600/800XL). Un-Assembled Printed Circuit Boards are available from OSH Park, and can be ordered by using the green order button (min order = 3 pcs). Note: Program the on-board PIC chip before installation in the Atari via the J2 header using an ICSP programmer. ​Schematics, PCB files, and Firmware are all available for download to the left. The zipped firmware file also contains the JOY2PIC Flashing ATR. ​For additional information, please reference the AtariAge Forum V-Gate discussion thread. There is an error in the design of this hardware. ​ It relates to the 'No-Color' non-selected state of the analog gate (U3). When not active, the floating intput to the color amp needs to be tied to either GND or +5V dependent upon PAL or NTSC. The present device has no way to accomplish this. See 1088XEL schematic for correct implementation. DO NOT PURCHASE PCB --- A revised design will be required. 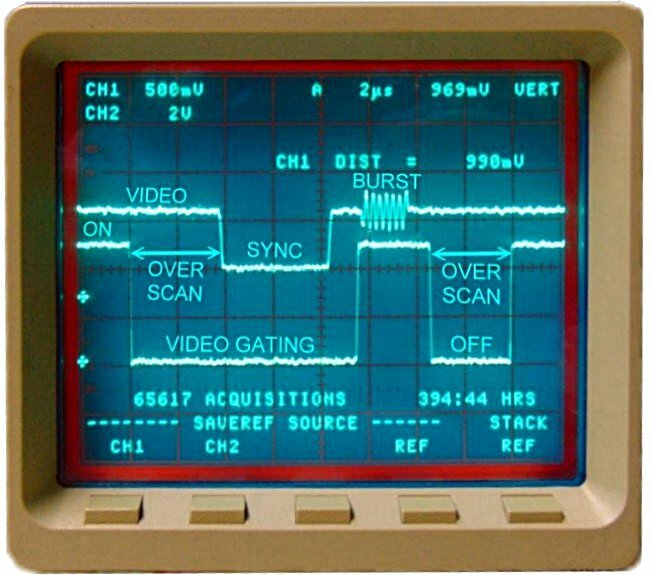 Precise timing of the video gating aspect is performed by an embedded PIC MCU clocked by the GTIA's 3.58 Mhz OSC pin, and then boosted up to 14.318 Mhz by an internal x4 PLL. Video gating (over scan deletion) can be disabled by bringing the 'EN' designated MCU pin to ground (Vss), and with no connection it defaults to an 'enabled' state. When piggybacked with the Atari's GTIA chip, the board is fully functional without any additional connections. 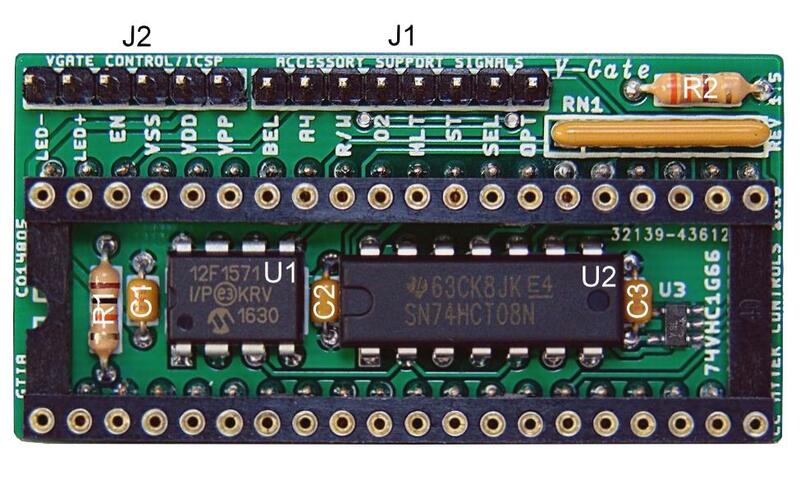 However if you wish to enable/disable or monitor this state, a switch and an LED can be connected to the V-Gate Control/ICSP header ( J2 ). This header also serves as the means to flash the MCU firmware. 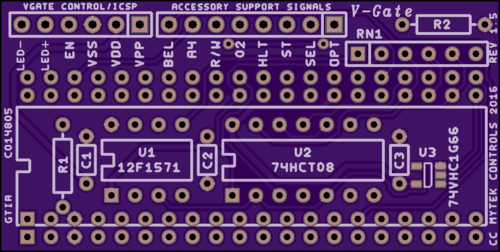 An additional header ( J1 ) breaks-out Accessory Support Signals for several of the popular A8 upgrades, thereby minimizing the number of wires that would otherwise need to be soldered to the A8 motherboard.